First we decluttered, then we cleaned, this week we're going to go through and organize. Now going through and organizing the entire kitchen could take quite a few days on it's own. So, let's just pick our biggest pet peeve and do that section. My biggest pet peeve is my pantry, it's often hard to find what I'm looking for so I think I'm out. I purchase it again and later find I actually have 3 cans of whatever it is repurchased. I also hate making grocery lists, I always forget something. So I've always meant to go back to using a perpetual pantry list, like I did in Illinois. So, I've take some time this week to put one together. So, here is my Master Grocery List, I'm filling it out today. It's in Microsoft Excel 2003 format, feel free to download it and modify it for your own personal use. 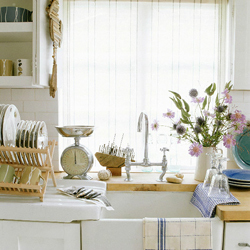 What's your pet peeve in your kitchen? Hey, where did you get that copy of my grocery list? LOL - Seriously, my pet peeve is the pantry too! I want everything at arm's reach at all times!